We read the important history of this trail as we hike along the .65-mile loop. Located at the east entrance of Okefenokee National Wildlife Refuge, it’s an upland trail that weaves through pines and saw palmetto dipping near the remnants of a doomed canal. We’ve explored the swamp by boat. We’ve sighted abundant wildlife at Chesser Island Boardwalk. We’ve identified interesting plants along the Cane Pole Trail. We spent the night under the darkest skies in Georgia. Okefenokee Swamp is the largest blackwater swamp, in North America. It’s home to more than 600 species of animals, some of them included on the endangered species list. 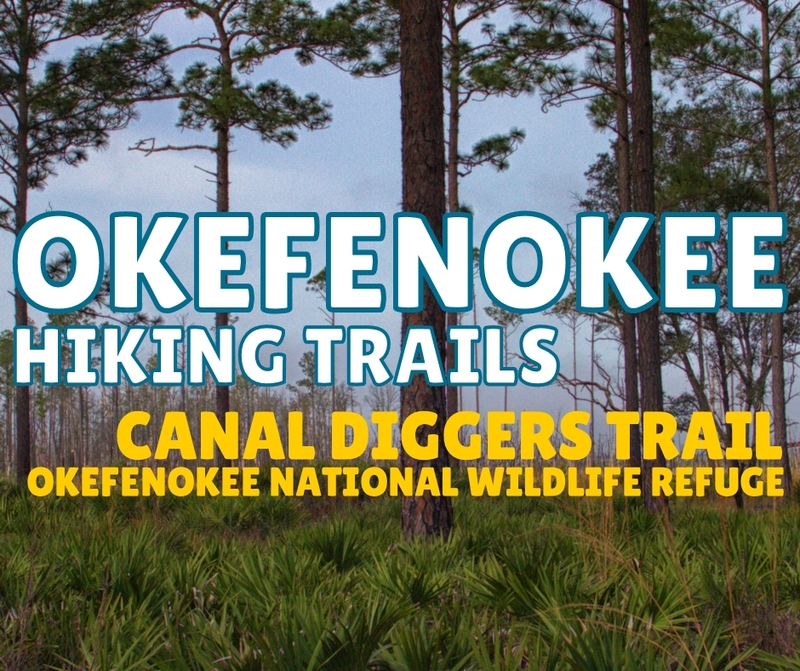 The last hike on our most recent visit to Okefenokee is the Canal Diggers Trail. This loop traces the history of a failed attempt to drain the swamp and end it all. Fortunately, the low-lying swamp didn’t cooperate. The canal diggers unearthed springs that fed water back into the swamp, instead of draining it into St Marys River. The trail is relatively easy at just over a half-mile. The land is slightly hilly. But, there are no long or steep inclines.